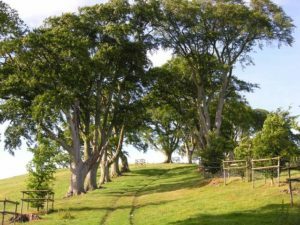 Bishop’s Castle Challenge Walk 2018- Section 2 – Homeward Bound. 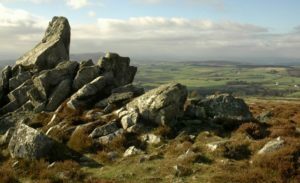 The walk goes through the woods and across fields to the Stiperstones Nature Reserve where it joins the Shropshire Way. 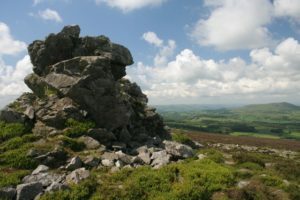 The path across the top of the Stiperstones Ridge is very rocky and the Challenge Walk diverts a little so you can enjoy the views while still walking! On the Stiperstones by John Holt. The path goes through Nipstone Nature Reserve and continues over moorland and farmland towards Bishop’s Castle. The path descends onto a tree lined avenue named “Linley Beeches” and onto a lne where there is a refreshment stop. The route continues past the long private drive to Linley Hall and then onto the little Hamlet of More. The village of Lydham is the next settlement before the path crosses the main A488 to Bishop’s castle twice before heading up hill, through the Foxholes Campsite to the town. © 2019 Bishop's Castle Challenge Walk. All rights reserved.